Today, we’re rolling out a major new release of MOW Scheduler. This release includes a new feature we call the “Offers Inbox”, which helps staff (“Volunteer Coordinators”) manage volunteer shift signups (“offers” to help) that are submitted online. Previously these submissions were sent and received by email, outside the system. This new feature makes things easier for both the volunteers and staff, and it also paves the way for some exciting new features such as “auto-approval” that will be available soon. To accommodate several new and upcoming features, we’ve eliminated the old “Reports” menu and moved the volunteer performance reports to the bottom of the “Jobs” menu. The “Admin” and “Help” menus have been moved to the right and are now represented by icons. sends the Volunteer Coordinator an email notification. The Offers Inbox has tools for the coordinator to easily turning these volunteer “offers” into filled slots. 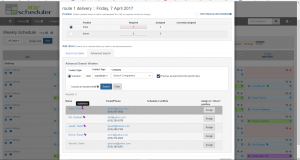 We invite current customers to view the new “Offers Inbox Tutorial“, available through the “Help” link the main menu bar of your MOW Scheduler site. The term “pickups” was a source of confusion. Gone. A contact’s email address and phone numbers may now be edited directly in the main contact form. All email notifications to staff and volunteers now use a more polished layout, and include a notice that explains that the notification is sent by MOW Scheduler on behalf of your organization. This eliminates a source of confusion with new volunteers about where the emails are coming from (us) and why (because they volunteer for you). You may now preview a “sample” of all notification emails (and SMS texts!) through the Admin/Notifications section. Previously, anyone who wasn’t signed in that tried to load your site’s home page http://yourorg.mowscheduler.com was redirected to the login page. This made sense for staff users, but could be confusing to volunteers who were looking for the public “available shifts” page. The new home page is helpful to all types of users. The old url http://yourorg.mowscheduler.com/jobs/available still works, but it now redirects to /helpwanted, so you don’t need to worry about broken links or obsolete bookmarks. Your volunteers will be able to self-register for an account that will allow them to sign up for shifts, view their current commitments and past volunteer activities, cancel shifts, update their contact info, etc. — without needing to contact their Volunteer Coordinator directly. When volunteers who have signed into the Portal sign up for a shift, we’ll know exactly who they are. So we have the opportunity to automatically complete the shift assignment and update the calendar — without staff intervention. You’ll be able to control which volunteers are eligible for auto-approval. Currently, all notifications related to shift signups and cancellations go the the email address (or addresses) specified for use on the public Help Wanted page. The new feature will allow individual staff members to “subscribe” to notifications related to the Job Groups they’re involved with. In this way, it will be possible for Volunteer Coordinators to get notified only about Kitchen shift signups, or only about routes that start from the West Side location. Our new and improved “Job Settings” page makes it super easy to update the miles and hours that volunteers contribute on each job. Most of the time you probably don’t even notice that MOWscheduler is quietly keeping volunteer score for you: who drove which route on what day, and the mileage and time they spent doing that. When those numbers are needed, whether tax season, PR or grant-writing time, they are right there with a few simple clicks on the “Volunteer Credits” page. Occasionally though, work is needed when clients are added, deleted, and/or reshuffled from one route to another. That’s when estimated shift duration and distance required to deliver the impacted routes need to be reviewed and adjusted to keep the records accurate. To make that work as easy as possible, we recently redesigned the “job settings” page. Volunteer resource requirements such as miles and hours, plus volunteer head counts and the weekdays applicable to each job, can all be reviewed and adjusted in one intuitive and productive environment. Our “Advanced Search” tab makes it easier to find a substitute driver for a route. Figuring out where to start when looking for someone to substitute for a route isn’t always simple. Determining which volunteers are likely to “step up” can depend on a number of factors that may be hard to remember, especially in a rush. There are several tools in MOW Scheduler to help you with that. For example, some routes may be tricky to navigate, so volunteers who have driven the same route before might be the best candidates. Or, possibly a pool of “regular substitutes” is the place to start. MOW Scheduler keeps track of the factors that may be most useful to you, and puts that information right where you might need it. So next time when you need to fill an open route, the “Advanced Search” tab is here to help. The Volunteer Coordinator’s dashboard now includes a widget for “Upcoming Anniversaries”. This new widget, and alongside its older sibling the “Upcoming Birthdays” widget, prepares the coordinator to greet and congratulate his/her volunteers every week. This new feature was suggested by our users at @MOWDurham. We liked it, so we did it. Thanks for the suggestion! 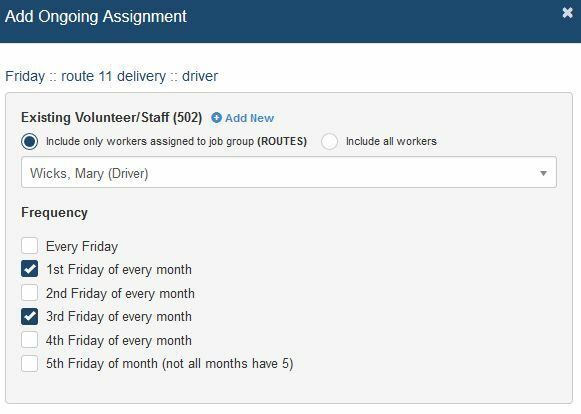 The “Available Shifts” page in the MOW Scheduler is a public page that can be linked from your social media or email requests for volunteers to help in filling “open routes”. The Available Shifts page shows current route and other job openings, and is continuously and automatically updated as openings occur and are filled in the system. New feature: Volunteers can respond by phone, text, or email, but previously we allowed only one email address to be used for receiving volunteer responses. Thanks to a suggestion by our users at Senior Connections in Atlanta (@SrConnections), you can now list multiple emails so that several people can be “keeping an eye” on volunteer responses at the same time. At Meals on Wheels, we rely on many volunteers who come in regularly to drive a route or pack meals. Even though they are “regulars”, they often have very different schedules. Mary may drive route 3 every 2nd and 4th Wednesdays, while Bob drives route 10 only on 1st and 3rd Tuesdays. 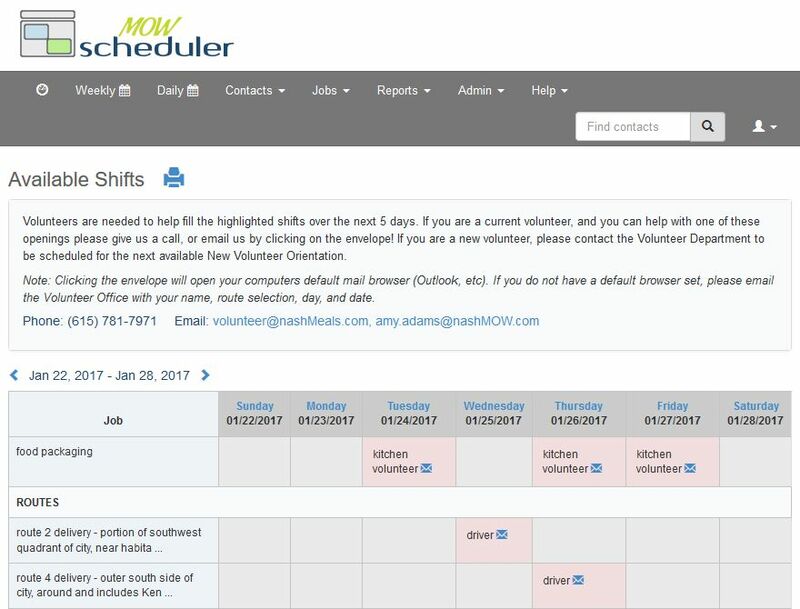 MOW Scheduler’s “Ongoing Assignments” feature, which stores different types of recurring schedules and uses them to automatically populate the job calendar, has been a major time-saver for the volunteer coordinators. 1. Multiple weeks of the month can be added (or cancelled) in one action. 2. An existing schedule can now be simply modified without having to vacate and start over. focus on usability: we’re constantly striving to make the every day tasks as simple as possible (but no simpler! ), and the complicated stuff doable. new features, including “monthly” ongoing assignments, job groups, performance reports, etc. easier setup, improved administration tools for adding new routes, importing volunteer data, etc. new users: in our first few months we’ve helped a number of customers successfully implement the Scheduler, and received a lot of valuable feedback in the process. conferences: it was great to meet so many motivated people at the national MoW conference in Nashville and the NY state conference. It’s nice to be able to put a face to the names, and our “early adopter” customers have become our most enthusiastic supporters. 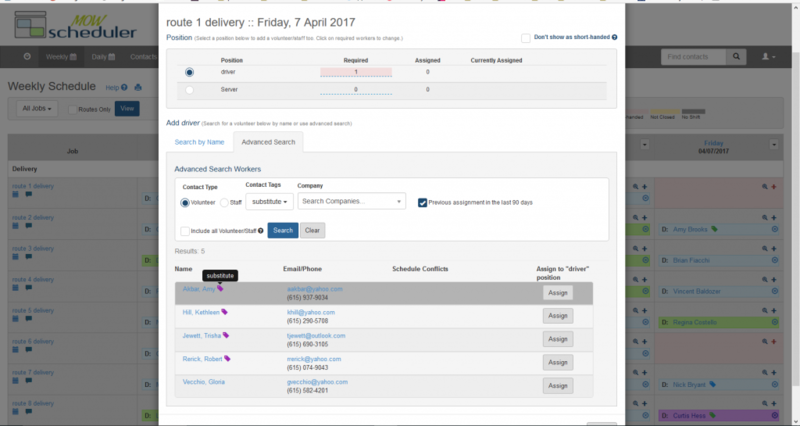 What’s next for MOW Scheduler? more features… what do you want to see? MOW Scheduler is a web application that helps Meals on Wheels and similar home meal delivery nonprofit organizations schedule their routes and other recurring volunteer commitments. Visit the website at www.MOWScheduler.com — then contact Cha through the form on the site, or by phone (315) 234-0079 x301 to talk about your needs or to schedule a demo.